Tamaqua’s elite built large, high style dwellings. A intact high style cluster is found in the 200 block of West Broad Street: Italianate examples at 223 and 246, Second Empire at 247, Queen Anne at “Queen Anne’s Lace” bed and breakfast at 214 West Broad Street and The Fitzpatrick House at 242, and Eastern Stick at the National Register-listed Ormrod House at 218. These high style Queen Anne brick and frame examples include towers, two-story bay windows, multi-paned windows, bracketed cornices, shingled gable ends, wrapping columned porches, high vermiculation and art glass. Additional high style Queen Anne examples are found in identical homes at 454 and 458 East Broad Street and in the 1903 iron-spot brick -- a yellow brick with mineral flecks -- Amandus Lutz House at 221 Cedar Street, which has peacock-feathered pattern transom windows at the second story. In the early twentieth century revival styles rivaled the Queen Anne for elite homes in the 500 block of East Broad Street. These include the Cornelius McGeehan House at 500 East Broad Street (1922-1924, now the Zizelmann Funeral Home), a Colonial Revival/Neo-Classical Revival granite home with full portico entrance, green tile roof and matching granite garage; the c.1920 Daniel Pfiel House at 518 East Broad Street, a brick Tudor Revival of Flemish bond with glazed headers, double or triple thickness slate roof, decorative chimney pots and matching brick garage and rear alley wall; the stucco Mission Revival at 522 East Broad Street built in 1890 by contractor Weaver with massive entrance columns and, again, a matching stucco garage; Weaver’s own home at 530 East Broad Street, a high style clapboard and shingle Queen Anne Free Classic with pyramidal roof and 3 story tower, wrap porch and art glass; the Benjamin D. Seltzer house at 540 East Broad Street, an ornate 17 room late Queen Anne house built in 1902 by architect James Schlegel; and 601 East Broad Street, a Free Classic tan brick with two story, highly shingled curved front bay and unique Art Nouveau window transoms. Approximately two-thirds of the dwellings in the historic district have at least one outbuilding. The majority of those are free-standing frame, concrete block, or brick garages or sheds showing the impact of the auto age. Although some are modern, most date between 1920 and 1945 and were not included in the resource count. 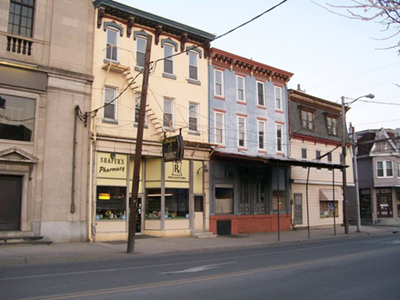 Twelve percent of the Tamaqua Historic District contributing buildings are commercial. These include hotels from early settlement, mid-nineteenth century brick buildings and high style late nineteenth and early twentieth century commercial structures, all testament to the legacy of coal. 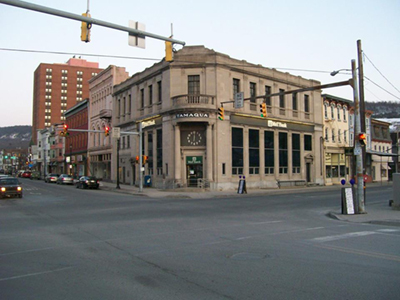 The earliest surviving commercial structures are hotels: the Little Schuylkill Hotel at 47 Market Street, the first hotel and Tamaqua’s first stone building, built in 1827 by the Little Schuylkill Navigation Company ( now private residences); the frame c. 1845 White Swan at 256 Cedar Street; the 1871 Kramer’s Hotel at 300 East Broad Street, once a stagecoach stop on the route to Mauch Chunk; and the 3-story Washington House (44 Mauch Chunk Street), a c. 1842-50 brick, side gable commercial block with continuous second/third story pillared porch with incorporated iron fire escape. Mid-nineteenth century commercial blocks include 104 West Broad Street (now Kutcher’s), a c. 1850 brick, highly altered at the facade but contributing with early features exposed on the east wall -- double end chimney, side lunette and S-shaped tie rods, and the National Register-listed 1850 Anthracite Bank Building at 133 West Broad Street, brick with intact marble first-floor facade. Late nineteenth century commercial blocks and major anchor buildings -- banks and a theater -- are concentrated in the downtown commercial district. They are most heavily concentrated in the downtown core from the Five Points intersection through the 200 block of West Broad Street, and through the 100 block of East Broad Street. (Residential and mixed-use buildings and conversions continue through West Broad Street’s 300 block through East Broad Street’s 400 block before becoming purely residential.) The generally three-story high style buildings are largely of brick or stone construction and sit very close together, often touching. Many have stores, shops or other businesses on the first floor and apartments or offices on the upper floors. Architectural styles represented include Italianate, Late Victorian, Classical Revival, Queen Anne, Romanesque Revival, Colonial Revival, Exotic, Art Moderne, Art Deco, and Commercial. High style Italianate rows are found at 112 and 123-125 East Broad Street, 40, 44 and 47 West Broad Street. 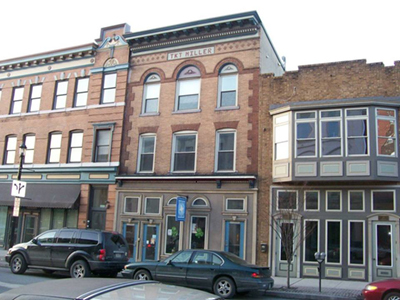 The first block of Center Street (east side) is an outstanding concentration of Italianate and Second Empire commercial blocks including Shafer’s Pharmacy (11 Center Street), an Italianate brick building with ornate stone shoulder moldings, detailed roof brackets and original front iron fire escape; 15 Center Street, with original intact storefront with 2 sets of paired arched doors and metal sidewalk hood on metal poles; the Second Empire 19 Center Street with original Eastlake storefront; and 21 Center Street -- also Second Empire -- with original storefront and intact sidewalk hood. The E.J. Fry Building at 10 West Broad Street and its copy, The Shepp Building at 12 West Broad Street, are ornate Queen Anne examples with intricate pressed metal cornices and brownstone trim. 251 West Broad Street is an intact 3-story Eastlake version with Queen Anne multi-light windows and sunburst cross gable detailing. Colonial Revival examples are at 39 West Broad Street. The Romanesque Revival was popular for high style commercial buildings and is seen in the Livingston Block at 18 West Broad Street, at 14 and 32 West Broad Street, and also at 108 and 109 East Broad, 14 West Broad. The 1900 Flat Iron Building at the Five Points intersection incorporates late Victorian and Colonial Revival elements. The Elks Lodge at 201 West Broad Street is a high style Colonial Revival style example with glazed headers, stone quoins, and classical cornice with modillion blocks, triglyphs, and circle motifs. The Colonial Revival Masonic Lodge at 139 West Broad Street has Egyptian Revival vulture and sun disc motif at the cornice (while the Odd Fellows Cemetery has several Exotic Style mausoleums). 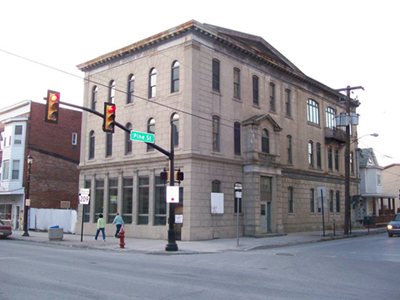 The Classical Revival style is seen in banks: The c. 1915 Peoples Trust Company Building at 100 East Broad Street, a temple front style with curved corner entrance; the 1905/1919 First National Bank of Tamaqua, now the Tamaqua Historical Society, at 114 West Broad Street; and the 1908 Tamaqua National Bank at 35 West Broad Street, also with rounded corner entrance. The Neoclassical Revival Post Office building at 399 East Broad Street also exemplifies the style. Additional commercial examples of the Classical Revival are found at 20, 24-26, and 43 West Broad Street and also in theaters -- The Majestic Theater and hotel (now housing) at 201 East Broad Street and the Regal and Blum Jewelers building, now the entrance to the new Salvation Army Community Center, at 105 West Broad Street. The Art Moderne is seen at 130 East Broad Street; Art Deco in the Jennings Building at 205 West Broad Street, a 3-story,5-bay commercial block with Chicago Style windows. Other commercial resources in the historic district include several 20th century automobile service stations, repair garages, or dealerships. These are concrete buildings, with stucco or veneer finish, and include the former auto showroom at 801 East Broad Street, the U.S. Towing and Demolition building --3-bay brick with Coca Cola ghost sign -- at 201 Cedar Street, a concrete block auto shop at 251 Cedar Street, a Mission Revival service station and adjacent Tamaqua Diner at 37 Center Street, the stucco-over-brick with stepped gable Rottet Motors at 117 South Greenwood Street, and a c. 1925 2-bay shop at 309 West Cottage Avenue. 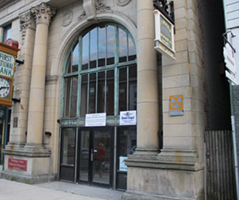 Early twentieth century (c. 1920) parking garages include 308-310 West Broad Street, a 2-story building with parapet roof and capacity of 35 cars and the 3-storybrick-faced tile “auto service and storage” building at 211-213 Rowe Street, capacity 40 cars. The Sprite Shirt Factory Building, 420 East Broad Street, incorporates a 35 car garage in its raised basement.